I contributed to the Brucespringsteen.net “Notes from the Road” for this show which can be found here. I reviewed this show for Backstreets (full review found there). When I had heard about the soundcheck – that it included so many songs from Nebraska, my expectation was that Bruce would choose the one that best fit the set and that would be the album’s representation in the show. Little did I know what he actually had in store! At one point during the show, Max’s setlist could be seen on the video screen and the first ten songs of the show were played as written, with “Highway Patrolman” initially intended for the spot where the “Sherry Darling” sign request went. As good as “Highway Patrolman” was, I wonder if it perhaps made the set at the expense of the soundchecked “My Father’s House,” which is in my opinion the superior choice. Once the show started I was also hoping that “Used Cars” might make a reappearance. These are only minor quibbles, however, as this was a great setlist. I mentioned this in the Backstreets review but Clark Gayton has become one of my favorite band members to watch on stage, both for his playing and also his dance moves. He may not have the same obvious energy of an Everett Bradley but it’s clear he has a great time on stage. Bruce took a particular shine to him tonight, calling him for the first horn solo on three different songs, and bringing him down front. Obviously the horn section is connected to Clarence by blood, in the form of Jake Clemons, but I like to think that Clark brings a good bit of Clarence’s spirit there too. The live stream of the event was great and I hope it extended the fundraising capacity of the event quite a bit. (Note to the organizers: if you’d asked for the $10 just to get to the stream, I’d have kicked it in just to watch). In my opinion, this was probably the best of the six sets Bruce has performed at the annual Stand Up For Heroes events. I note that I am also partial to the very first one, done in 2007, which had a setlist of This Hard Land, Devil’s Arcade (in its only ever acoustic performance) and Thunder Road. Bruce seemed in great voice, and the version of “We Take Care of Our Own” was perhaps stronger than any of those done at the rallies in support of Obama over the past month. At this point, anything from Tunnel of Love is a treat but I quite enjoyed the acoustic “Tougher Than The Rest” with Patti. It’s the first time they’ve sung it together in an acoustic format since their performance at Sonny’s Southern Cuisine in Asbury Park in July 2002. I just wish Patti could make it to more of the regular E Street shows so this would have chance at making the set. The live stream unfortunately cut off just as the auction was about to take place: traditionally, the guitar Bruce was just playing is auctioned off. I reviewed this show for Backstreets; the review can be found here. One outtake that didn’t make the Backstreets review: a hilarious moment during “Spirit in the Night” where Bruce called for some crowd participation. 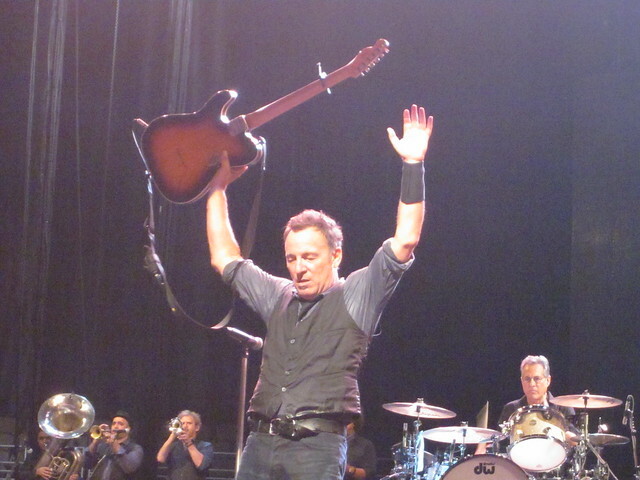 In his introduction to the song, Bruce has taken to telling the crowd that “the E Street Band has come thousands of miles to get the answer to Just. One. Question!” asking “Who knows what that question is?” and then holding out the microphone to someone in the crowd. My “Notes from the Road” are at www.brucespringsteen.net.